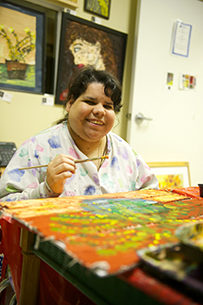 MacDonald Training Center, Inc. encourages Creativity and Self-Expression through its Fine Arts Studios. Chris McDarby is a very independent man. He lives in his own condo, which he owns. He works at a Walgreens drugstore, at a job he has had for six years. (He enjoys scanning items for customers the most!) He has a long term girlfriend. (They met in middle school and have been dating steadily since high school). 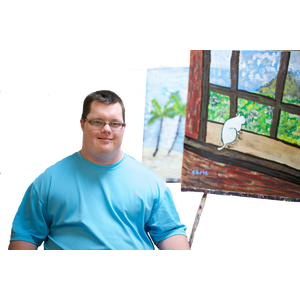 And he is developing quite a following as an emerging artist developing his skills in the MTC Fine Arts Studios located at James Ranch in Plant City. Chris is the first to say that his artistic talent was undiscovered before he came under the tutelage of MTC Fine Arts nstructor, Jan Radovan. At his own request, Chris recently addressed people gathered at a reception in our new art gallery. He wrote and typed his speech which he delivered movingly. After thanking Jan and MTC, Chris said, “Before, I thought of art as something to look at…Now it is some-thing I can do.” Those in the audience may have left that evening thinking there is not much that Chris cannot do! Chris’ family joins in showing their appreciation to MTC for bringing out this hidden talent in their son. “At first I was a little skeptical, when people kept saying he was so good. Then I remembered how artistic my husband’s mother was.” says Chris’ mother, Val McDarby. She also says that he is more like her other children than he is different. That Chris has challenges, is a fact in his life, but clearly not the defining one. MTC Kelly Kreg’s energy, joyful nature and playful spirit shines through her artworks, which are as fresh, cheery and inspiring as she is herself. Her favorite subjects are usually flowers, hearts and small animals, although lately she has enjoyed creating several works of abstract graffiti art for commercial office spaces. Vibrant, upbeat, unendingly positive and determined, Kelly perfects her skills each time she enters the MTC Fine Arts Studios. Despite limited use of her arms, Kelly is an avid maker of collage art. To obtain the shapes she desires, Kelly often tears papers into small pieces by using her teeth, always smiling as she achieves her desired results. In recognition of her talent, determination and ability as a collage artist despite limited use of her arms, Kelly was invited to finish a collage alongside the artist who created it, Derek Gores, at the Tampa Bay Lightning’s first Celebration of the Arts. Kelly and Penny Vinick, owner of the team, glued on personal and family photos to the collage which was installed on the Club level of the Tampa Bay Times Forum. Stop by next time you visit the Tampa Bay Times Forum to see Kelly’s smiling face among the crowd! The MTC Fine Arts Studios actively promotes the Work of its Artists. Art is available for sale at The Joy McCann Culverhouse Fine Arts Gallery, located at MacDonald Training Center on Cypress Street in Tampa. Artists are compensated for the sale of their artworks. The MTC Fine Arts Studio receives a portion of each sale which is directed back to the ongoing needs of the art program. Work is created at both the Tampa and Plant City locations. Art created in the Fine Arts Studio is seen in Exhibits and Galleries in Tampa. Thoughtful photography of the MTC Fine Arts Studios by Alisha Pergola.